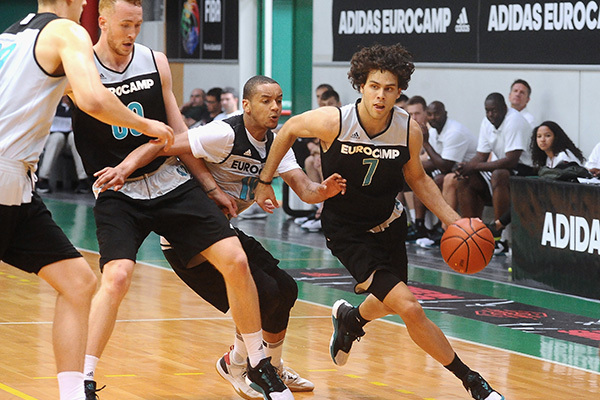 The fifteenth annual adidas EUROCAMP is right around the corner! The adidas EUROCAMP will be held in Treviso, Italy, June 9-11, at the La Ghirada Sports Complex and will showcase the best international players in the only NBA sanctioned pre-draft camp outside of the United States. The three day camp brings the best international talent together with former and current NBA coaches and players. Some of the participating teams this year include two under-18 adidas USA Select teams and Slovenia under-20 men’s national team. HallPass Media will be broadcasting a full slate of games each day LIVE on adidasEurocamp.com. Former NBA All-Star and current Commissioner of the Russian Basketball Federation, Andrei Kirilenko, will be a guest speaker prior to tip-off on Saturday. Kirilenko spent the majority of his career in Utah with the Jazz, but also played for the Timberwolves, Nets, and 76ers before retiring in 2015. Coaching director Bill Bayno (Indiana Pacers) will return with an elite coaching staff that includes veteran assistant coaches Nick Nurse (Toronto Raptors), Ed Pinckney (Minnesota Timberwolves), Kaleb Canales (Dallas Mavericks), Chris Finch (Denver Nuggets), Eric Hughes (Milwaukee Bucks), Jim Boylen (Chicago Bulls) and David Adelman (Orlando Magic). Maurizio Gherardini, the founder of EUROCAMP and Fenerbahce Istanbul general manager, returns as the camp director. 93 first and second round draft picks have participated in the camp, including NBA standouts Serge Ibaka (Toronto Raptors), Danilo Gallinari (Denver Nuggets), Goran Dragic (Miami HEAT), Brandon Ingram (Los Angeles Lakers), Jaylen Brown (Boston Celtics), Dragan Bender (Phoenix Suns) and Thon Maker (Milwaukee Bucks). Forty-three former EUROCAMP participants currently hold NBA contracts and 64 currently play in EuroLeague Basketball.